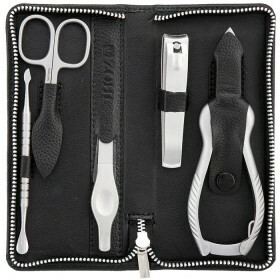 Lightweight and compact travel manicure set Premier is a treasure for those who are often on the go. 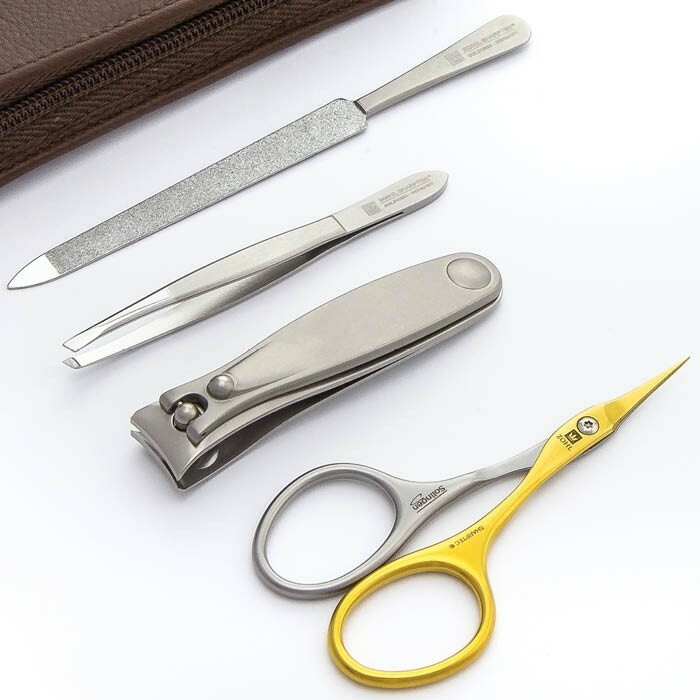 Crafted in Germany from surgical stainless steel, it includes 4 highest quality Solingen manicure instruments for all-round finger- and toenail care whilst away from home. 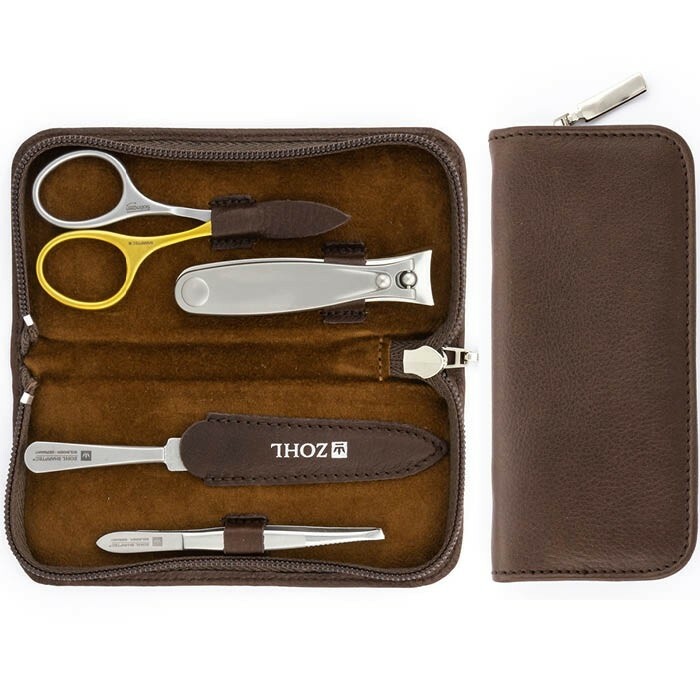 Perfectly sharpened and long lasting, the nail tools include large Solingen nail clippers, extra fine manicure scissors with self-sharpening effect, sapphire nail file and eyebrow tweezers. 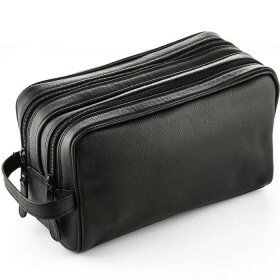 Luxury brown leather case protects the tools in individual pockets while sturdy metal zipper secures them in any luggage bag. 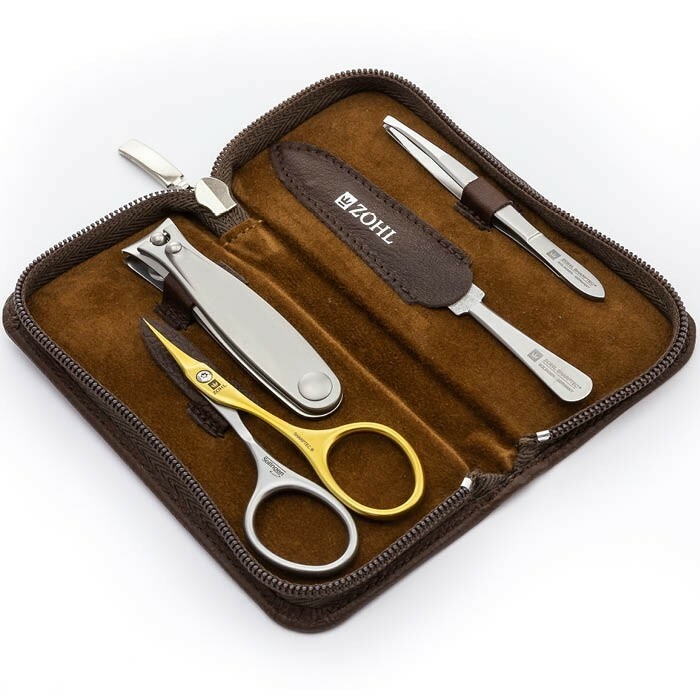 Ideal gift for a high traveller, this professional manicure set is a smart investment that will give many years of fantastic service without any need of sharpening. 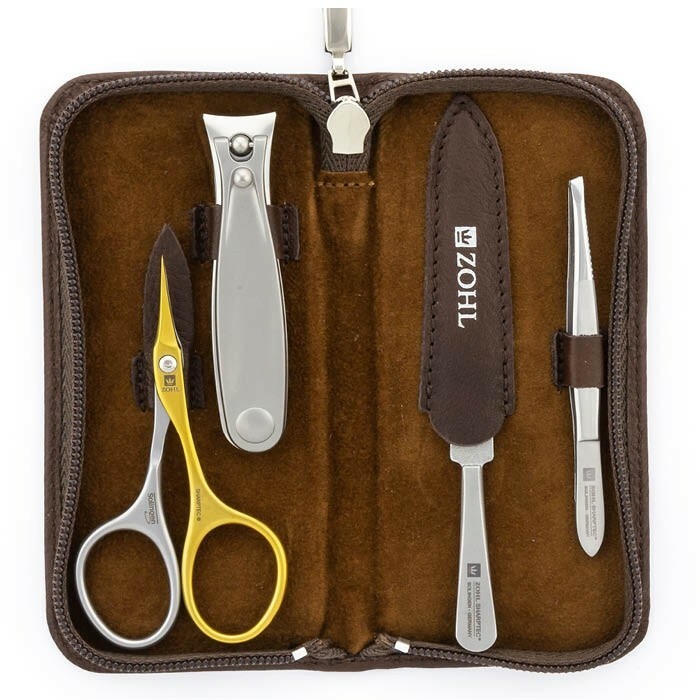 The small Solingen manicure set Premier by ZOHL unveils 4 authentic German manicure instruments of the highest quality. Perfectly sharp and precise, they will keep delivering excellent service through decades thanks to strong surgical steel they are made of. Professional stainless steel is forged in a special way to achieve the most optimal hardness responsible for the sharpness of the cutting edge. 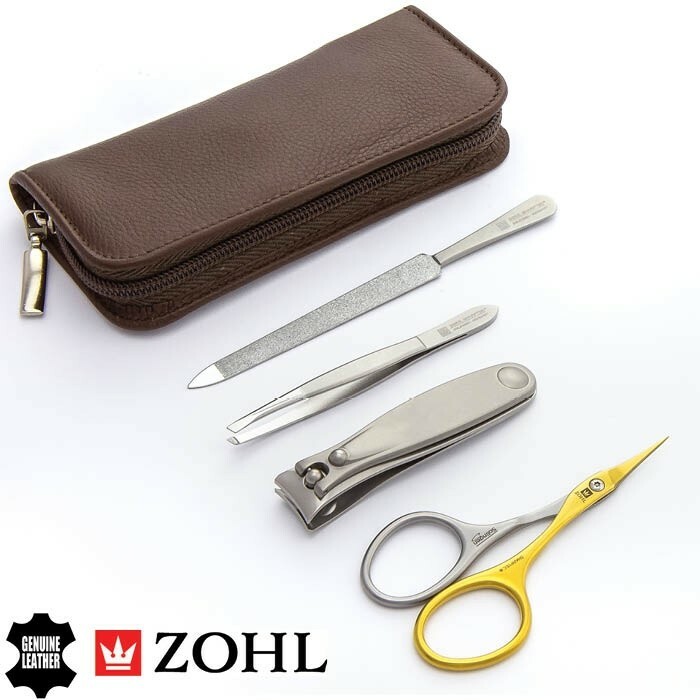 This makes all SHARPtec tools stay sharp for a very long time without re-sharpening – the benefit that only exclusive manicure sets like ZOHL's Premier can deliver. 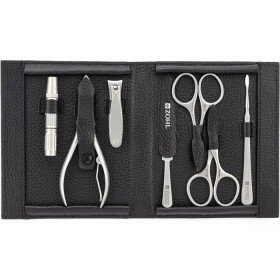 In addition, this high quality manicure set includes the most advanced professional manicure scissors with double lifetime. 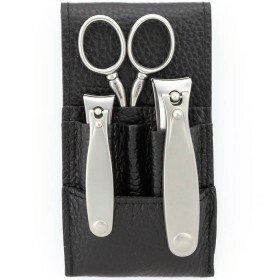 The titanium blade primes the other blade with every opening and closing of the scissors, making the scissors last twice longer without any need of re-sharpening. 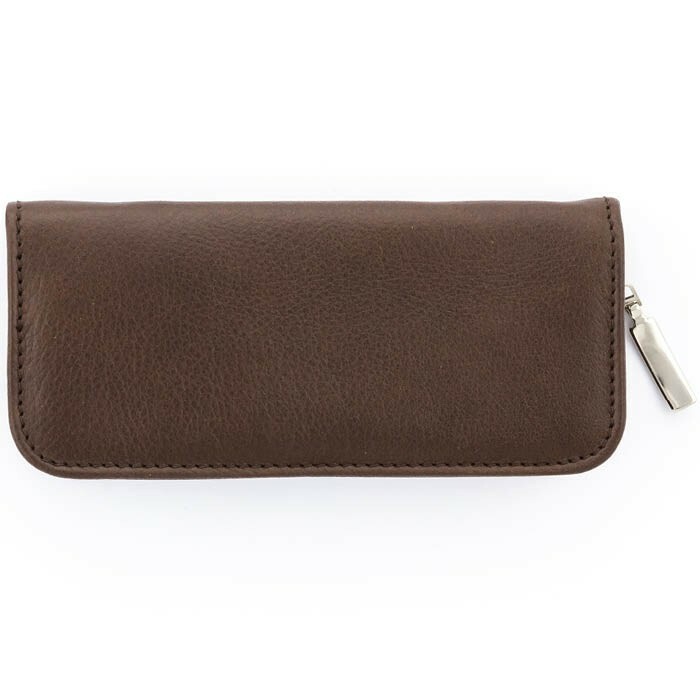 Premium quality of the nail instruments is further highlighted by the luxury brown leather case with a sturdy metal zipper, making it a perfect travel accessory and an ideal gift for a frequent traveller. 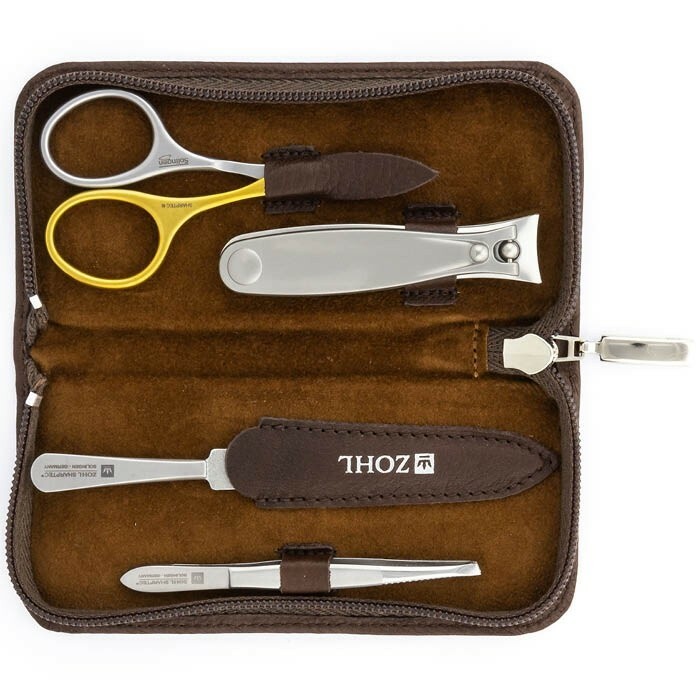 Slant Eyebrow Tweezers (9cm) – the best eyebrow tweezers that outperform any high quality tweezers, according to our customers. 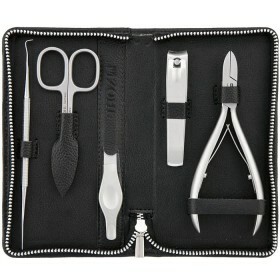 To enjoy this stunning manicure set for a long time, always remember to place it in check-in luggage when travelling, to avoid confiscation. 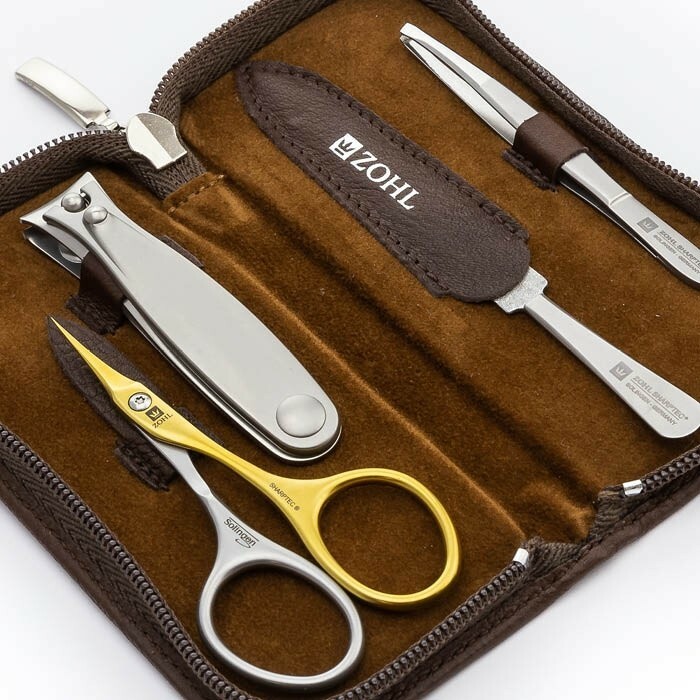 Once you try the Premier manicure set, you are guaranteed to fall in love and won't prefer any alternatives to its premium quality.